San Diego County S-6 winds along the hillside overlooking Lake Henshaw along the southernmost two miles of East Grade Road. Photo taken 06/16/06. County Road S-7 constitutes a scenic route along a 13.9 mile course from California 76 at Lake Henshaw northwest to Palomar Mountain State Park in north San Diego County. San Diego County S-7 (East Grade Road) north proceeds past Crestline Road and approaches the local fire station on Palomar Mountain and CR S-6 (South Grade Road). Photo taken 11/11/10. County Road S-6 (South Grade Road) branches north from County Road S-7 (State Park Road) to Upper French Valley and Palomar Observatory. State Park Road spurs west to Boucher Hill. Photos taken 01/21/02. Confirming marker for San Diego County S-7 north, posted after the separation with South Grade Road by the Palomar Mountain business plaza. Photo taken 06/16/06. Second photo taken 01/24/02. While CR S-7 ends at the entrance to Palomar Mountain State Park, a very narrow back road, Nate Harrison Grade, leads from the park down toward the valley floor. This road is not a good choice for most vehicles due to the narrow roadbed, extensive unpaved segments, and occasional closures for weather, fire or other reasons. Photos taken 06/16/06. San Diego County S-7 travels along the edge of Palomar Mountain, overlooking the San Luis Rey River and Pauma Valley while advancing toward the entrance into Palomar Mountain State Park. Pull-outs along the roadside allow for slower traffic to stop and also offer places to take in the scenic views from the mountain top. Photos taken 06/16/06. Northbound San Diego County S-7 enters Palomar Mountain State Park. Activities at this park include hiking, camping, and nature watching. A popular trail takes hikers past Doane Pond. Photo taken 06/16/06. Hidden in the scrub on the right side of the road by the state park entrance is an end San Diego County S-7 route marker. Photo taken 06/16/06. A wide turnout here allows larger vehicles to turn around before entering the state park. A ranger station lies beyond the entrance sign where visitors are charged a fee for entry into the park. Photo taken 06/16/06. The first reassurance shield for San Diego County S-7 is posted after the exit from Palomar Mountain State Park. Photo taken 06/16/06. Two-lane San Diego County S-7 carries mostly recreational traffic to and from Palomar Mountain State Park. Photo taken 06/16/06. A few privately owned properties also take their access from San Diego County S-7. Photo taken 06/16/06. Eastbound San Diego County S-7 (State Park Road) approaches San Diego County S-6 on Palomar Mountain. Photo taken 06/16/06. County Road S-6 follows South Grade Road north to the Palomar Observatory. Turn right for S-6 south to Pauma Valley and Valley Center and S-7 southeast to Lake Henshaw. Photo taken 06/16/06. County Roads S-6 and S-7 come together at this intersection governed by a yield sign. A small business plaza lies on the northwest corner of the junction. Photo taken 06/16/06. Beyond a short overlap, CR S-6 (South Grade Road) turns west toward Frazier Point and SR 76 at Pauma Valley. CR S-7 continues southeast along East Grade Road to Birch Hill. Photo taken 06/16/06. Confirming marker and mileage sign posted after the separation with San Diego County S-6 (South Grade Road) along CR S-7 east. Lake Henshaw lies 14 miles ahead. Photo taken 11/11/10. Crestline Road spurs north and east from San Diego County S-7 onto Birch Hill, connecting East Grade Road with Palomar County Park. Photo taken 11/11/10. Continuing southeast from Birch Hill, CR S-7 (East Grade Road, also known as Highway to the Stars) follows a series of gentle curves from Palomar Mountain toward Jeff Valley. Photos taken 06/16/06, 11/11/10. San Diego County S-7 is considered to be the gentler and easier of the two main highways onto Palomar Mountain, but it is significantly longer than CR S-6, which has quite a few switchbacks and a steeper descent. Photos taken 06/16/06, 11/11/10. East Grade Road lowers into Dyche Valley beyond milepost 8. Photos taken 11/11/10. County Road S-7 winds northward around the Pine Hills to Will Valley. East Grade Road turns back south at Parayne Hill. Photos taken 06/16/06, 11/11/10. Traveling southeast along a winding stretch east of Love Valley CR S-7 gradually lowers in elevation, dropping over 1,000 feet in elevation from 4,000 feet near Will Valley. Photos taken 11/11/10. The Henshaw Scenic Vista located at milepost 1.8 provides an unobstructed look at the lake spreading to the east. Photos taken 06/16/06. The final mile of San Diego County S-7 (East Grade Road) curves southwest by the Lake Henshaw spillway to cross the San Luis Rey River ahead of California 76. Photos taken 06/16/06. San Diego County S-7 (East Grade Road) south ends at California 76 just west of Lake Henshaw. California 76 travels east to California 79 and west to Pala and Interstate 15. Photo taken 11/11/10. Doane Pond is one of the most popular hiking destinations within Palomar Mountain State Park. Photos taken 06/16/06. Views from the Henshaw Scenic Vista point along County Road S-7 (East Grade Road). 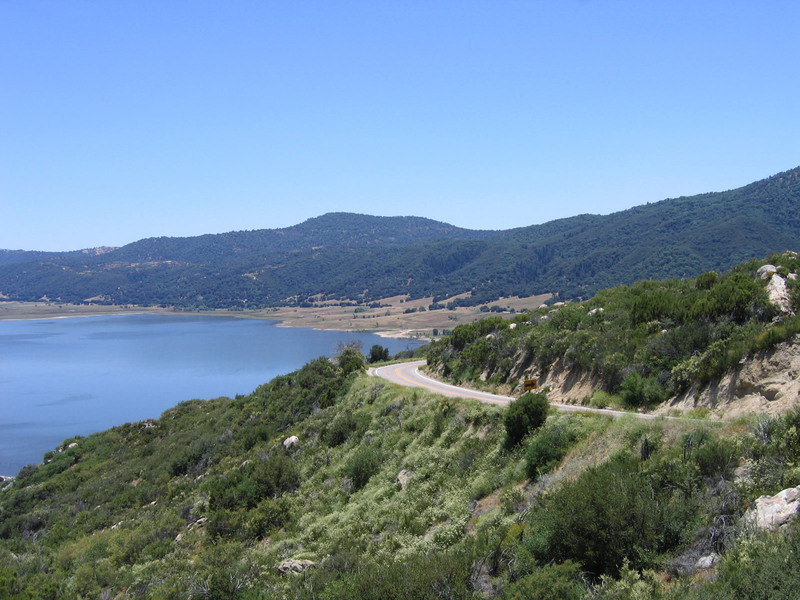 Lake Henshaw is a reservoir owned by the Vista Irrigation District. Henshaw Dam, built in 1923, holds back waters within the lake. Below the dam, the water flows into the San Luis Rey River. The lake level varies depending upon how much rain falls during the annual rainy season. Photos taken 06/16/06, 11/11/10.